Leslie W. Abramson, Canon 2 of the Code of Judicial Conduct, 79 Marquette L. Rev. 949 (1996). Leslie W. Abramson, Specifying Grounds for Judicial Disqualification in Federal Courts, 72 Neb. L. Rev. 1046 (1993). Leslie W. Abramson, Appearance of Impropriety: Deciding When a Judge’s Impartiality “Might Reasonably Be Questioned”, 14 Geo. J. Legal Ethics 55 (2000). Leslie W. Abramson, The Judicial Ethics of Ex Parte and Other Communications, 37 Hous. L. Rev. 1343 (2000). Leslie W. Abramson, Judicial Disclosure and Disqualification: The Need for More Guidance, 28 Just. Sys. J. 301 (2007). Leslie W. Abramson, The Judge’s Ethical Duty to Report Misconduct by Other Judges and Lawyers and Its Effect on Judicial Independence, 25 Hofstra L. Rev. 751 (1997). Sarah M.R. Cravens, In Pursuit of Actual Justice, 59 Ala. L. Rev. 1 (2007). Sarah M.R. Cravens, Judges as Trustees: A Duty to Account and an Opportunity for Virtue, 62 Wash. & Lee L. Rev. 1637 (2005) (judicial accountability and published opinions). Monroe H. Freedman, Judicial Impartiality in the Supreme Court – The Troubling Case of Justice Stephen Breyer, 30 Okla. City U. L. Rev. 513 (2005). Charles Gardner Geyh, Judicial Disqualification: An Analysis of Federal Law (Federal Judicial Center, 2d ed. 2010). Charles Gardner Geyh, Why Judicial Elections Stink, 64 Ohio St. L.J. 43 (2003). Cynthia Gray, The Line Between Legal Error and Judicial Misconduct: Balancing Judicial Independence and Accountability, 32 Hofstra L. Rev. 1245 (2004). Bruce A. Green, Fear of the Unknown: Judicial Ethics After Caperton,60 Syracuse L. Rev. 229 (2010) (arguing, among other things, that notwithstanding the Caperton dissent’s fears, it is doubtful that the opinion will cause a bombardment of disqualification motions that would hamper the judicial process). Mark I. Harrison & Keith Swisher, When Judges Should Be Seen, Not Heard: Extrajudicial Comments Concerning Pending Cases and the Controversial Self-Defense Exception in the New Code of Judicial Conduct, 64 N.Y.U. Ann. Surv. Am. L. 559 (2009). Mark I. Harrison, Sara Greene, Keith Swisher & Meghan H. Grabel, On the Validity and Vitality of Arizona’s Judicial Merit Selection System: Past, Present, and Future, 34 Fordham Urb. L.J. 239 (2007). Dr. Roger E. Hartley, “It’s Called Lunch”: Judicial Ethics and the Political and Legal Space for the Judiciary to Lobby, 56 Ariz. L. Rev. 383 (2014). Pamela Karlan, Electing Judges, Judging Elections, and the Lessons of Caperton, 123 Harv. L. Rev. 80 (2009) (discussing the consequences of judicial election versus appointment and the problem of tackling structural concerns through the vehicle of individual rights, among other thoughts). Andrew L. Kaufman, Judicial Correctness Meets Constitutional Correctness: Section 2C of the Code of Judicial Conduct, 32 Hofstra L. Rev. 1293 (2004). Phyllis Williams Kotey, Public Financing for Non-Partisan Judicial Campaigns: Protecting Judicial Independence While Ensuring Judicial Impartiality, 38 Akron L. Rev. 597 (2005). Alex Kozinski, The Real Issues of Judicial Ethics, 32 Hofstra L. Rev. 1095 (2004). Gerald Lebovits et al., Ethical Judicial Opinion Writing, 21 Geo. J. Legal Ethics 237 (2008). Steven Lubet, It Takes a Court, 60 Syracuse L. Rev. 221 (2010) (arguing that disqualification motions should not be decided solely by the challenged judge; the decision instead should be referred to the entire court). Steven Lubet, Judicial Discipline and Judicial Independence, 61 Law & Contemp. Probs. 59 (1998). Steven Lubet, Questioning Ethics, Yale L.J. (The Pocket Part), Jan. 2006 (federal judicial selection). Raymond J. McKoski, Charitable Fund-Raising by Judges: The Give and Take of the 2007 ABA Model Code of Judicial Conduct, 2008 Mich. St. L. Rev. 769. Raymond J. McKoski, Ethical Considerations in the Use of Judicial Stationery for Private Purposes, 112 Penn. St. L. Rev. 471 (2007). Geoffrey P. Miller, Bad Judges, 83 Tex. L. Rev. 431 (2004). David E. Pozen, Judicial Elections as Popular Constitutionalism, 110 Colum. L. Rev. 2047 (2010). Douglas R. Richmond, Bullies on the Bench, 72 La. L. Rev. 325 (2012). Ronald D. Rotunda, Judicial Disqualification When a Solicitor General Moves to the Bench, 11 Engage: The Journal of the Federalist Society’s Practice Groups 94 (2010). Ronald D. Rotunda, Judical Disqualification in the Aftermath of Caperton v. A.T. Massey Coal Co.,60 Syracuse L. Rev. 247 (2010) (examining historical reasons for judicial disqualification under constitutional law; arguing the “disadvantages of a vague rule that introduces transaction costs in the form of uncertainty”). Ronald D. Rotunda, Judicial Transparency, Judicial Ethics, And a Judicial Solution: An Inspector General for the Courts, 41 Loy. U. Chi. L.J. 301 (2009). Ronald D. Rotunda, The Propriety of a Judge’s Failure to Recuse When Being Considered for Another Position, 19 Geo. J. Legal Ethics 1187 (2006). Ronald D. Rotunda, Judicial Ethics, The Appearance of Impropriety, And the Proposed New ABA Judicial Code, 34 Hofstra L. Rev. 1337 (2006). Stephen A. Saltzburg, A Grandslam of Professional Irresponsibility and Judicial Disregard, 34 Hofstra L. Rev. 783 (2006). James Sample, Democracy at the Corner of First and Fourteenth: Judicial Campaign Spending and Equality, 66 N.Y.U. Ann. Surv. Am. L. 727 (2011). James J. Sample, Court Reform Enters the Post-Caperton Era, 58 Drake L. Rev. 787 (2010). James J. Sample, Caperton: Correct Today, Compelling Tomorrow, 60 Syracuse L. Rev. 293 (2010). Roy A. Schotland, Caperton Capers: Comment on Four of the Articles,60 Syracuse L. Rev. 337 (2010) (discussing due process and issues in implementing Caperton). Roy A. Schotland, Proposed Legislation on Judicial Election Campaign Finance, 64 Ohio St. L.J. 127 (2003). Jeffrey W. Stempel, Chief William’s Ghost: The Problematic Persistence of the Duty to Sit, 57 Buff. L. Rev. 813 (2009). Keith Swisher, Recusal, Government Ethics, and Superannuated Constitutional Theory, 72 Md. L. Rev. 219 (2012). Keith Swisher, Legal Ethics and Campaign Contributions: The Professional Responsibility to Pay for Justice, 24 Georgetown J. Legal Ethics 225 (2011) (addressing attorney and law firm judicial campaign contributions and the resulting judicial recusal/disqualification problems). Keith Swisher, Pro-Prosecution Judges: “Tough on Crime,” Soft on Strategy, Ripe for Disqualification, 52 Ariz. L. Rev. 317 (2010). Keith Swisher, When Judges Should Be Seen, Not Heard: Extrajudicial Comments Concerning Pending Cases and the Controversial Self-Defense Exception in the New Code of Judicial Conduct, 64 N.Y.U. Ann. Surv. Am. L. 559 (2009) (with Mark I. Harrison). Keith Swisher, The Moral Judge, 56 Drake L. Rev. 637 (2008) (article for symposium issue cosponsored by the American Judicature Society). Keith Swisher, The Unethical Judicial Ethics of Instrumentalism and Detachment in American Legal Thought, 43 Willamette L. Rev. 577 (2007). Elizabeth G. Thornburg, The Curious Appellate Judge: Ethical Limits on Independent Research, 28 Rev. Litig. 133 (2009). 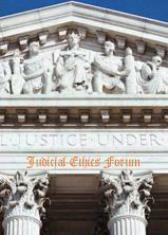 Russell R. Wheeler, A Primer on Regulating Federal Judicial Ethics, 56 Ariz. L. Rev. 479 (2014). Penny J. White, Relinquished Responsibilities,123 Harv. L. Rev. 120 (2009) (discussing Caperton).